In the wild, a pack of wolves is essentially a close-knit, co-operative, extended family unit. When cubs born to the alpha pair in the Spring emerge from the den to explore the world at 3 to 4 weeks old, they are greeted with great excitement by their older siblings, aunts and uncles. All are keen to get to know the new members of their family and to help with their upbringing and protection . . . . including, for one of the adults, fulfilling the duties of ‘babysitter’ whilst the rest of the family are away on the hunt for food. 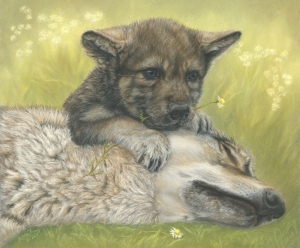 The animals featured in this painting are based upon individual wolves in the care of The UK Wolf Conservation Trust. The Babysitter is available in its original pastel format, mounted and framed in the highest quality materials, and also as Signed Limited Edition prints in 2 sizes. A percentage of net proceeds from sale of prints will be donated to The UK Wolf Conservation Trust. Visit the ordering page here to purchase now, or contact Anita for further details.